GREENDALE -- Greendale is flexing its green thumb with a new floral installation that is larger than life. "We try to do something that other people are not," Anne Marie Pierce, Village Center Manager said. "The sunflowers have brought a lot of happiness to people." Wisconsin magazine but couldn't forget about the Village he loves. "Since he's a Greendale resident and has a tremendous love for Greendale, he thought, let's give them to all Greendale residents as well," Pierce said. "If we're going to do that, let's plant some in downtown Greendale." However, these aren't just any ordinary sunflower. As seen in the name, they are mammoth, standing between 10 and 15 feet tall. "They're taller than I ever thought they'd be," Terry Krueger, Commercial Facilities Supervisor said. "I've never seen them in real life. I've only seen them in pictures. This is definitely one of the prized jewels down here for sure." Krueger is one of the people who helps take care of all of the green life in the Village Center. While the giant bulb at the top of the sunflower is the size of a dinner plate, it's actually the dozens of leaves that fuel the plant to sky high heights. "That's why these leaves are so huge and what helps them get so tall," Krueger said. "The leaves are the powerhouse of the plant. It's absorbing all the sunlight and converting it into the energy the plant needs." It's the same process for the giant pumpkins the Village is growing nearby. Half a dozen pumpkins sit in a patch across a pedestrian bridge from the sunflowers. However, these won't be used for jack-o'-lanterns this Halloween. Krueger says they weight roughly 500 pounds each. These "little" elements are what make him proud of Greendale and residents in the area share the same sentiment. 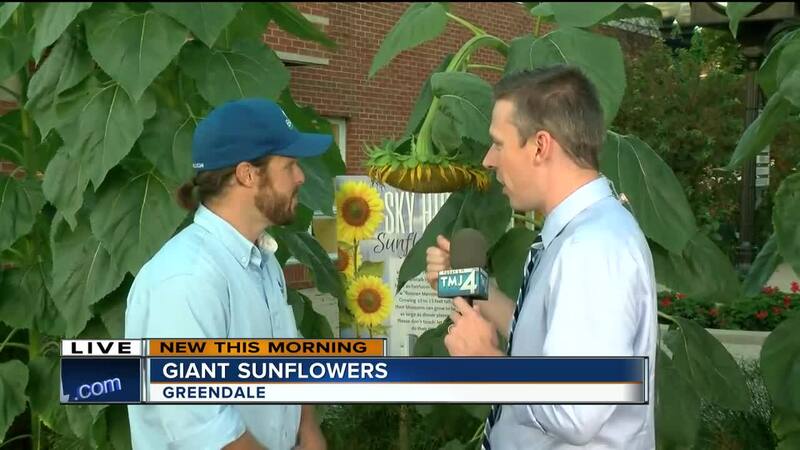 "The flowers are beautiful and the sunflowers are great," Debbie Barth of Greendale said. "It makes your day when you get up in the morning. We like to sit and have coffee in the morning. It's nice to see how big they are." 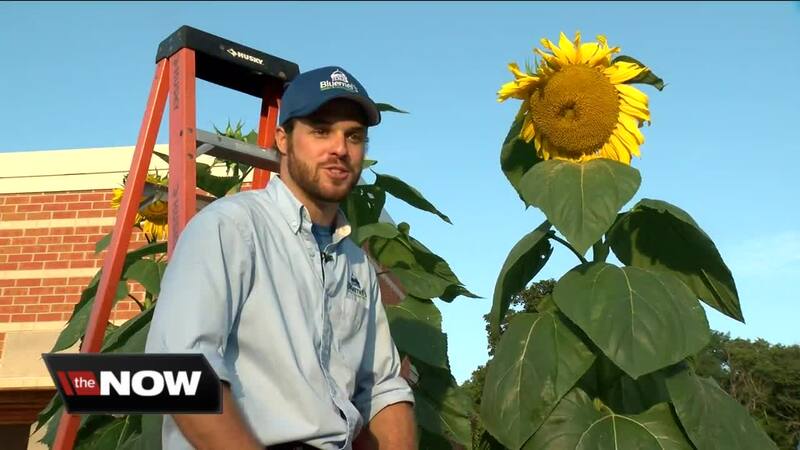 "It's really cute when the younger ones look up and they ask their parents how tall they are and people try to guess, as to [the sunflowers] height," Pierce said. "These really catch people's eyes and you can see them as they drive along Broad Street, they drive a little slower. They stop and look at them. It makes me happy." The flowers will also serve as a tasty treat. Each flower will produce roughly 1,000 sunflower seeds which can be harvested and eaten. They may also save some for next year. "We'll probably plant more next year," Pierce said. "It's been so great. I'll plant some in my backyard too. They're amazing."